Call it a cosmic scene investigation. A team of astronomer sleuths has identified the trigger for a powerful supernova that exploded four centuries ago, finding it to be the collision of two white dwarf stars. The discovery settles decades of questions over the origin of so-called Type 1a supernovas, researchers said. Astronomers have long suspected that two stars were responsible for the explosion, with one being a white dwarf — a compact, dying star. But scientists weren't sure if both culprits were white dwarf stars that crashed, or consisted of one white dwarf that siphoned off material from a regular companion star. Both scenarios could cause the supernova. But some of that doubt has been laid to rest. Astronomers Bradley Schaefer and graduate student Ashley Pagnotta, both of Louisiana State University, used a Hubble Space Telescope photo of the supernova SNR 0509-67.5 as a critical clue to determine that two white dwarf stars collaborated to set off the star explosion. Pagnotta presented the results at the 219th American Astronomical Society meeting in Austin, Tex., today (Jan. 11). The research is also detailed in this week's edition of the journal Nature. The discovery occurred last year as the astronomers worked on a proposal to search for a companion star in the debris of SNR 0509-67.5, a supernova remnant located about 160,000 light-years away in the nearby Large Magellanic Cloud, a satellite of our own Milky Way. (A light-year is the distance that light can travel in one year – about 6 trillion miles, or 10 trillion kilometers.) But a glance at the Jan. 25, 2011, Astronomy Picture of the Day saved them the trouble. "They had taken the image we wanted with a different scientific purpose," Schaefer told SPACE.com. They printed the image and used a ruler to estimate the supernova remnant's center, then searched for a companion, but they found no trace of one. The quick and dirty process only took half an hour, but answered the question of several decades. Schaefer describes it as "the classic 'eureka' moment." Of course, a more in-depth search was needed to be certain, he added. 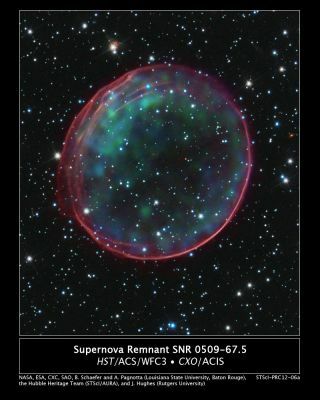 The spherical supernova remnant exploded from a single source that a companion star would have once orbited. The first step, then, was finding that point. To calculate the exact center, they needed more than a ruler. The pair used three different measurements to determine the source, and all three gave the same region of space. If the companion was a white dwarf, the collision between the two would have obliterated both. But a regular, main sequence star should still remain. It would no longer be orbiting the destroyed white dwarf, as the blast would have "blew it away," Schaefer explained. Surprisingly, the center of the ring boasted an object with an amorphous shape. The team's first instinct was that it was simply a background galaxy that happened to be located in the line of sight with the middle. "An ex-companion would have to be a point source," Schaefer explained. They are in the middle of taking spectra to confirm that it is simply a coincidence, but Schaefer is confident it will prove to be irrelevant. "It looks like a background galaxy, and it quacks like a background galaxy, so I think it probably is a background galaxy," he said. But this is the only object anywhere near the center, and there are no point sources that would indicate a leftover star. The lack of a remaining companion star is evidence that the explosion that formed SNR 0509-67.5 was not a combination of a white dwarf and a main sequence star, known as a single-degenerative system. This left astronomers with only one other theory still standing, a so-called double-degenerative system made up of two white dwarf starsthat collided. "For the first time, we have a decisive answer," Schaefer said. "What we have done for 0509 is eliminated all the 0509 single-degenerative models." The weakest point, he added, is that this is a decisive result for only a single system. "If there is only one progenitor class, we've solved it," he said. They know without a doubt that a double white dwarf system birthed SNR 0509-67.5, providing the first conclusive proof of such an origin, he said. It's the first concrete answer to a problem the National Academy of Sciences named as one of the top nine questions facing astronomy, in its latest astrophysics decadal review. Schaefer added that, technically, another model may exist to explain the birth of Type 1a supernovas — one that scientists just haven't thought of yet. But he points out that theorists have struggled over the problems for decade, and so such a scenario seems unlikely. He goes on to quote the fictional detective Sherlock Holmes, calling him "one of my heroes." "When you have eliminated the impossible, whatever remains, however improbable, must be the truth," Schaefer said. "Double degeneracy is the only thing remaining, and it’s not even that improbable," he added.